A person just used up all of detergent. Smart washing machine recognized this and ordered another detergent from a nearby market. Payment was taken care by digital currency stored within an account made to purchase consumable items. The owner of a nearby market confirmed breakdown of an order sent by the Smart washing machine through a computer. After checking that the payment was deposited, the owner ordered detergent to be delivered and notified the Smart washing machine about an estimated delivery time. This Smart washing machine then notified its owner that the order and the payment were completed and that new detergent will be delivered within couple days. Walmart and IBM introduced their innovative experiment in China. They are planning to introduce blockchain technology to provide bring safer food on dinner tables throughout China. Walmart newly opened ‘Walmart Food Safety Collaboration Center’ in Beijing while IBM and Tsinghua University decided to work together to improve a way where food is traced, delivered, and sold to entire consumers in China. Blockchain technology was used for their giant project that was designed to improve transparency and effectiveness of supply network record. If blockchain technology is used, it is possible to trace every step of how food is ultimately brought to a dining table digitally. Although this seems like a story that comes from a science fiction, innovative projects that are applying blockchain to various industries are happening globally. Strictly speaking, blockchain is being used as a fundamental technology for new industries in the future. There was an incident that drew attention of spectators at CES 2015. It is a distributed IoT (Internet of Things) network called ‘ADEPT (Autonomous Decentralized Peer-to-peer Telemtry)’ that applied blockchain concept to IoT. ADEPT is an IoT platform that combines BitTorrent’s file-sharing, Ethereum’s execution method of Smart Contract, and P2P (Peer to Peer) protocol called Telehash. It will not be long before people will be able to purchase items through P2P network and sign Smart Contracts. Samsung Electronics’ refrigerators provide lifecycle of products as they register product information into blockchain platforms that are shared globally. They leave records of sales history into local blockchain when corresponding products are set to be sold to consumers and manage every process from production to sales. Although current blockchain transactions are seen as distribution of virtual currency, it is expected that they will be incorporating Smart Contracts in the future. British Government and Australian Government are using blockchain technology for payments for using chargers and individual transactions of dump power from households and management of operation of drones respectively. Blockchain can reduce costs by eliminating an use for an intermediary. Australia’s dump power transactions in the past especially had intermediaries that cost a lot. However, these transactions were converted to P2P transactions through blockchain technology. Governments and businesses from all over the world are competing against each other as they predict that blockchain will bring huge changes in the future. Blockchain indicates arrival of hyper-connected society where there are no boundaries and every person and object are connected. Hyper-connected society indicates a world where people and objects are intimately connected online and offline through digital technologies. Hyper-connected society does not need closed business systems such as domestic market and trades between particular groups. Characteristics of blockchain platforms have something in common with phenomenon that will occur from hyper-connected society. Blockchain eliminated third-party credit guarantee businesses and allow transactions to be achieved through participations and collaborations between members of network. Global economic forum (Davos Forum) is estimating that 80% of banks in the world will introduce blockchain technology to their systems. A consulting group called Accenture is predicting that growth period of blockchain will arrive after about 5 years. Research about blockchain is actively taking place not only amongst global consortiums like R3CEV and Hyperledger, but also amongst individual business such as stock exchange. Although research is taking place based on IT and financial companies, it is likely that blockchain will also be applied to various areas such as IoT as businesses are attempting to apply blockchain to various industries such as music, game, healthcare, and distribution. There are businesses such as Samsung, IBM, Microsoft (MS), Intel, Goldman Sachs, JP Morgan, and Citi Group that are active in Industry 4.0 through blockchain. These businesses have something in common and it is the fact that they are making enormous amount of investments into blockchain as they understand infinite possibilities that can arise from blockchain. 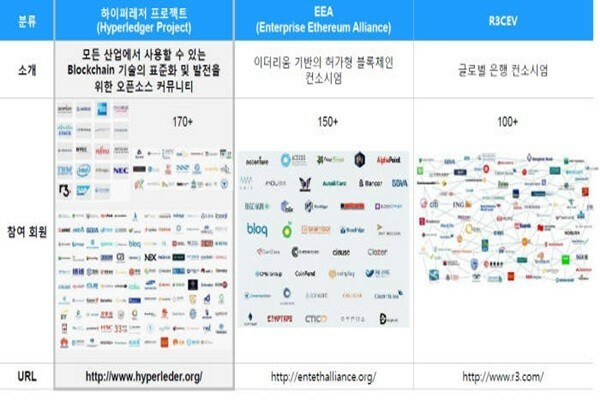 R3CEV and Hyperledger are main consortiums that are currently researching and developing blockchain technologies. R3CEV is a blockchain consortium that was formed in September of 2015 with a financial service technical company called R3 at the center. It has about 50 global financial organizations that include Goldman Sachs, JP Morgan, Morgan Stanley, and UBS as its members and it also has South Korean banks such as KEB Hana Bank and Shinhan Bank as its members. R3CEV signed a partnership with MS in last April and it applied Ethereum and Microsoft’s Cloud service platform called Azure to establish its blockchain infrastructures. R3CEV is applying blockchain to wire transfer and payments in a short-term and it is applying blockchain to other areas such as stock, corporate bond, insurance, and real estate in a long-term. R3CEV is going to develop and introduce stable financial transaction systems that are based on blockchain technology through 8 detailed areas such as payment, transaction, corporate bond, and insurance. Development of new digital currency using blockchain technology is also taking place. Four global investment banks such as UBS, Deutche Bank, Banco Santander, and Bank of New York Mellon co-developed public payment currency, which is digital currency proposed by UBS, and are strengthening their businesses so that central banks and financial organizations from countries adopt this digital currency. Mitsubishi Tokyo UFJ Bank, which is the biggest private commercial bank in Japan, is also developing its own digital currency called MUFG Coin and its goal is to commercialize coin trades through Smartphones. Costs for wire transfer and currency exchange can be reduced drastically when digital currency is commercialized. Hyperledger is a distributed ledger project that was formed at the end of 2014 with Linux Foundation at the center and it has about 80 businesses such as IBM, Intel, JP Morgan, and Samsung SDS as its members. Hyperledger developed ‘Blockchain Explorer’ that introduces projects that are pushed by its members so that anyone can search these projects. Its strategy is to reduce unnecessary competitions and strengthen collaborative systems. BAML, HSBC, and Infocomm Development Authority of Singapore succeeded in developing Smart Contract service based on Hyperledger Fabric. Through this service, they succeeded in simplifying trade finance procedures that requires much paperwork. IBM has strengthened its collaborative systems to provide entire process of blockchain. From structure of basic software based on Hyperledger project, IBM is going to provide platforms for fast development, safe Cloud infrastructures, and blockchain solutions that can solve business problems of particular industries. Blockchain projects that are led by Hyperledger are taking places all over the world. Dubai Government is going to process visible trades through blockchain and completed a platform that provides real-time information on Dubai customs, trace of imported and exported goods by trade companies, and status of shipments. London Stock Exchange and Japan Stock Exchange introduced blockchain technology for risk management and retail markets respectively. Tokyo Mitsubishi UFG Bank is using blockchain technology to manage design of contracts with its business partners. Chinese Walmart is using blockchain technology to manage delivery and sales processes of food and beverage. Recently, 7 Europeans banks chose IBM’s blockchain applied with Hyperledger Fabric to establish new trade financial platforms. These platforms are designed so that they can improve overall transparency of trades by simplifying and accelerating trades between domestic and international small and medium European businesses. These platforms are executed through IBM Cloud and are designed so that they connect relevant people through online transactions and mobile devices. They can simplify trade financial processes by solving management and security problems involving trades. Besides these two consortiums, many other national consortiums are also actively taking places. Global Blockchain Committee in Dubai and BCCC (Blockchain Collaborative Consortium) in Japan were established in November of 2015 and April of 2017 respectively. China and Russia established consortiums called FBSC (Financial Blockchain Shenzhen Consortium) and a consortium based on Qiwi, which provides payment services, respectively. Samsung and LG are also working on blockchain technology. Samsung Group along with IBM are working on a project that applies blockchain technology to IoT under a concept called ‘ADEPT’. Samsung Group also introduced private blockchain amongst its financial subsidiaries such as Samsung Securities, Samsung Card, Samsung Life Insurance, and Samsung Fire & Marine Insurance. Samsung SDS also signed a strategic partnership with a blockchain company called Blocko to push for businesses in South Korea and other countries together and to co-develop relevant technologies. Including Samsung Card’s blockchain project that is currently being developed, they are going to find various opportunities and new businesses such as certification, wire transfer, and payment that are related to blockchain. LG is working to commercialize blockchain with its subsidiary LG CNS at the center. It became the first South Korean business to develop a platform for distributing unlisted stocks. Instead of issuing certificates in a form of a document to stockholders, it is going to issue electronic stocks using blockchain. Through this platform, LG CNS issued pilot electronic stocks of South Korean startups such as Blocko, Omecca and others. Besides Samsung and LG, SK C&C is also pushing for development of ID service based on blockchain. It started developing blockchain digital asset and certified services for essential documents such as letter of credit and others that are needed for international trades. Hyundai BS&C also made an announcement recently that it is going to start blockchain-based digital asset business. It announced its blockchain digital asset system called ‘Hyundai DAC’ to respond to organic flow of digital asset and IoT environments.